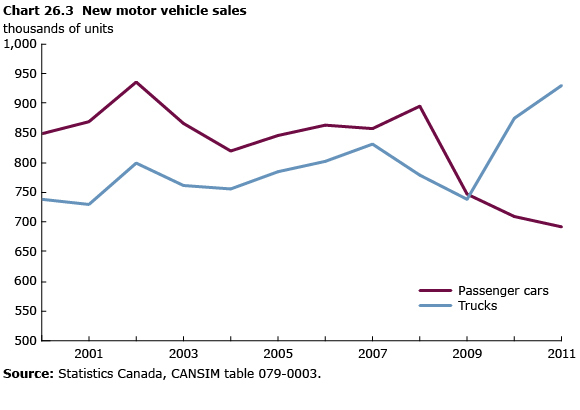 Just over 1.6 million new cars and trucks were sold in Canada in 2011, a 2.3% increase from 2010. Sales of trucks (including minivans, sport-utility vehicles, light and heavy trucks, vans and buses) increased by 6.3% to 929,498. At the same time, new car sales fell by 2.7% to 691,079 cars. It was the second consecutive year in which the volume of new truck sales surpassed that of passenger cars. The majority of passenger cars, 63%, were manufactured in North America in 2011, up from 55% in 2010. About 14% were manufactured in Japan, down from 18% in 2010. Other countries accounted for the remainder (23%). New motor vehicle sales rose fastest in the three Prairie provinces: Alberta (9.6%), Saskatchewan (7.3%) and Manitoba (7.0%). Sales fell in Quebec (1.5%), Nova Scotia (3.7%) and Newfoundland and Labrador (2.7%).